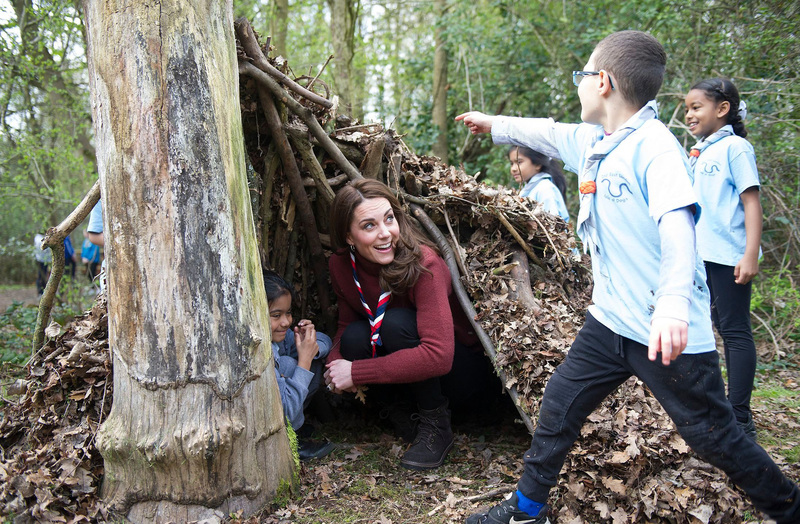 The Duchess of Cambridge mucked in with the Scouts on a visit to Gilwell Park on Thursday, as part of a scheme aiming to bring scouting to younger children. Ditching her trademark heels in favour of her favourite brown Chloe boots (£360), the Duchess rocked a more laid-back look for the outdoors engagement. But perhaps her most interesting fashion pick of the day was her dark red J. Crew turtleneck, which is on sale for just £89! The jumper is still on sale in the Duchess’s mahogany colour, but it’s also available in a range of other colours including a blush pink, a navy, a khaki green and a light grey. Although it may be slightly more than you’d normally spend on a jumper, the ‘super-soft’ blend of yarn used in this one means it’ll last, and feel cosy, for years to come. You can buy the J Crew jumper here. It’s one of Catherine’s favourite items from her wardrobe, and she’s worn it multiple times before – including on a trip to a community garden in Islington, London, earlier this year. The Duchess looked chic and comfortable playing and laughing with the children at Gilwell Park – even going as far as crouching down for a game of hide and seek in the trunk of a tree. The 37-year-old Duchess took part in a day of team building exercises with the young children, who were the same age as her five-year-old eldest son Prince George, to mark the 100th anniversary of the scouts at its Gilwell Park headquarters. It was announced in 2012 by Kensington Palace that the outdoorsy Duchess would become a Scout leader as part of her patronage of charities and bodies. The Duchess of Cambridge is known to be a lover of the outdoors, and it seems she enjoyed the more relaxed engageemnt. She is even reported to have said, “Normally I have to do this in high heels, this is much easier!” Nice to know even the royals have that favourite comfy jumper they can’t resist re-wearing! FROM: Woman & Home, our sister site. Written by Kate McCusker.